What is Asset Location? And Why it is So Important. While many investors are focused on asset allocation – finding the right mix of asset classes for their level of risk tolerance, goals and investment time frame – smart investors are also closely watching their asset location. We at Capital Advantage take a tax-aware approach to stock and bond ownership. As a rule of thumb, it’s most advantageous to concentrate stocks in taxable accounts and bonds in retirement accounts. Numerous studies support this rule, and we’ll explain why after first delving into an example. Suppose an investor has $700,000 in retirement accounts (e.g., Roth IRA or 401(k)) and $300,000 in taxable accounts. She wants a 50% stock/50% fixed-income (i.e., bonds and cash) asset allocation. She plans to follow the guidance and focus her taxable accounts on stocks and devote her retirement accounts to bonds. Thus, her portfolio might put the $300,000 in taxable accounts fully into stocks, while the retirement accounts are divided between $200,000 in stocks and $500,000 in bonds. Or, if she wants to hold $40,000 in cash as liquidity reserves, then these funds must be held in a taxable account to serve their purpose. But the remaining $260,000 in her taxable accounts plus $240,000 in her retirement accounts should be allocated to stocks, while the final $460,000 on the retirement side is bonds. There are two principal arguments for this asset location strategy. First, long-term capital gains and qualified dividends on assets held in taxable accounts receive preferential tax rates (i.e., 0% or 15% for most investors). In contrast, interest income on bonds when held in taxable accounts is taxed at higher than ordinary income-tax rates. Second, the government bears some risk on assets held in taxable accounts. Suppose stocks earn pretax returns of -7%, 8%, and 23% in a three-year period. The investor’s average pretax return is 8%, with a standard deviation of 15%. If the investor realizes these gains each year (technically, in a year and one day) and the losses are used to offset long-term gains, then the after-tax returns are -5.95%, 6.8%, and 19.55%. The investor’s average after-tax return is 6.8%, with a standard deviation of 12.75%. Notice that the government bears 15% of stocks’ risk when held in a taxable account. Since stocks are riskier than bonds, it is more desirable to let the government shoulder part of the downside. Furthermore, the taxpayer can control when gains and losses are realized. In general, the realization of capital gains can be timed for low-tax-rate years and capital losses for high-tax-rate years. Suppose our investor buys five stock funds in her taxable account at the end of one year. Near the end of the next year, four of the assets have risen in value, while the fifth has lost value. She could sell the losing asset and, if she has no other gains or losses, she could write off up to $3,000 of this loss against her income that year, with any remaining losses carried forward to future years. Finally, suppose a taxable account is jointly owned by a husband and wife. The husband dies. The cost bases of the assets are stepped up to their market values at his date of death. She does not owe taxes on prior unrealized capital gain. Years later, she dies and her children inherit the assets. The children’s cost bases for these assets are stepped up to their market values at her date of death. As before, no one would pay taxes on prior unrealized capital gain. So, pay attention to where you locate assets, while attaining your target asset allocation. The newly raised standard deduction means taxpayers need to get strategic to reap tax benefits from their deductions and charitable donations. Here’s how. The Tax Cuts and Jobs Act has altered the tax and investing landscape in many ways, including how we need to think about planning our tax deductions. Taxpayers are allowed to claim various tax deductions that will reduce their income and therefore the amount of taxes that they pay. These deductions have often encouraged behaviors like charitable giving, or acted as subsidies for expensive purchases like mortgages. But you can no longer take these deductions for granted, and without proper planning, you will lose them. All taxpayers have the option of taking a standard deduction, which is a standard amount that essentially creates a floor for deductions. In 2017, the standard deduction was $6,350 for individuals, and $12,700 for married couples. However, the new tax law raised that amount, increasing it drastically to $12,000 for individuals and $24,000 for married couples, an increase of almost 100%! Due to the increase in the standard deduction amount and the limits placed on itemized deductions (such as state and local taxes), this means that for 2018 (and the foreseeable future), households are more likely to take the standard deduction. The Congressional Budget Office estimates that 90% of households will be taking the standard deduction in the future. The increase in the standard deduction means that many people either will not have enough deductions to exceed the standard deduction amount, or will have just enough itemized deductions to barely exceed the amount. For the borderline candidates, this has led to the comeback of “clumping” or “bunching” deductions, a strategy where careful planning of the timing of your deductions enables you to receive the maximum amount of deductions over a certain period of time. If you make charitable donations in January and December of the same year, you may itemize both of those deductions within that year, thus exceeding the standard deduction. The following year, you could then take the new standard deduction. This means that you would receive a greater tax benefit for the same dollar amount of charitable contributions, simply by making them in one year instead of two. To accomplish this, you need to think about your tax strategy in a two-year time frame and make your donations accordingly. For example, let’s say Bill’s itemized deductions are $15,000 one year, composed of $8,000 miscellaneous deductions and $7,000 of charitable donations. It seems he would be better off itemizing, as his itemized deductions are $3,000 higher than the standard deduction of $12,000. However, by bunching two years of charitable contributions, or $14,000, into one year, he can up his deductions to $22,000 that year. The next year he can take the standard deduction of $12,000. 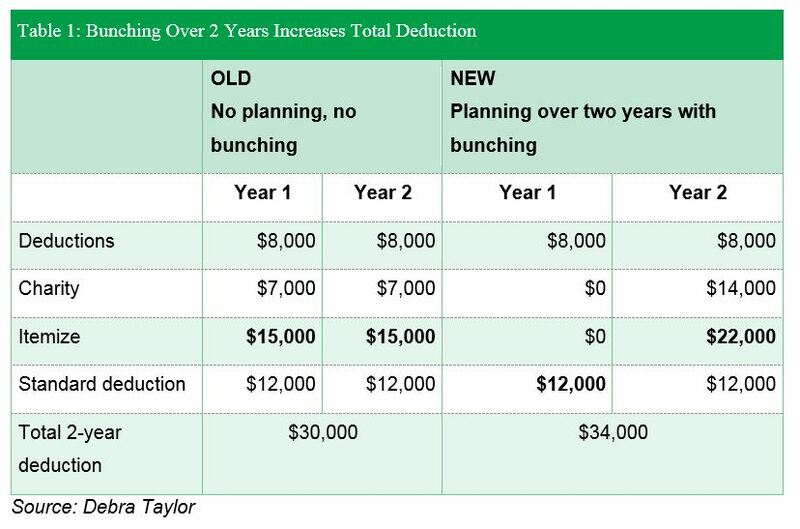 As shown in the table below, bunching means Bill can increase his total deductions over two years from $30,000 to $34,000. By thinking of your tax situation over a two-year period, you are able to maximize deductions and benefit the most from the newly increased standard deduction. Although the example used involves charitable deductions, the strategy can be employed with medical expenses, state income taxes, and property taxes as well. For example, if you are considering elective medical or dental procedures, instead of spreading those medical expenses over two years as you would have done in the past (to even out cash flow), you should bunch these procedures into one year. The strategy will not only help with maximizing deductions but it will also help with exceeding the 7.5% AGI minimum, which is increasing to 10% in 2019 anyway. Remember, these medical and dental procedures are often not covered by Medicare and could include dental implants, hip replacement surgery, hearing aids, laser cataract surgery, and other quite common health care events. Unfortunately, there are many deductions that are not easily shifted from one year to the next. For instance, the timing on mortgage payments and the interest payments typically can’t be controlled easily. Handling them requires some creativity. But, remember that two quarters of property taxes can typically be paid in advance in the previous year and first quarter state estimated tax payments can be paid in the fourth quarter of the previous year. Those who are interested in lumping their charitable giving may also want to consider using a donor-advised fund, or DAF. The strategy involves making multiple years’ worth of donations in one tax year to the fund for the tax benefit, then distributing gifts to charities in subsequent years. DAFs have been around for a while, but with the new tax act, creating one can be more advantageous than ever in terms of controlling the timing of the deduction and the gift. For example, let’s say Jane normally make $200,000 per year. However, due to the sale of a real estate property, her income for this year will be $800,000. She wants to decrease her taxable income by committing $250,000 to some charities in the upcoming years, but isn’t certain which ones she’d like to support. If she makes the full $250,000 donation to a DAF this year, she can claim a full $250,000 charitable deduction this year, and then periodically donate from the DAF to the charities of her choice in the upcoming years (see the table below). This satisfies her charitable goals while ensuring she receives the full charitable deduction in the year when their income is highest. (Note: Don’t forget the 60% AGI maximum when making these contributions). Bunching and clumping is a great way to maximize tax deductions, both in the short and long-term, potentially saving you lots of money. Keep in mind that timing is key to successfully implementing the clumping strategy, but overall it’s not a very difficult strategy to implement once you get the hang of it. Most retirees just want to visit Oahu and pamper their grandkids, but there are critical financial tasks to handle throughout retirement. Here, we round up the important dates and duties to prepare you, whether you are retired, semi-retired, or pre-retirement. Believe it or not, the year is slowly coming to a close, and we turn our thoughts to 2019. As the new year begins, most retirees aren’t thinking about tax deadlines and health care. But they need to, since their employers are no longer taking care of these duties. In addition, there are many details such as reviewing estate plans, contributions to charities, retirement portfolios, and family gifts that need to be completed each year. We’ve put together a list to help you remember these important dates and tasks. While tax laws and Medicare benefits may change, the fact is you still have to deal with them. Retain peace of mind, knowing you are tending to everything that is important in a timely fashion. There are a few key changes to be aware of heading into 2019. First, Medicare is changing its enrollment periods for Medicare Advantage plans. Currently, you can sign up for, drop, or change an MA plan during the fall open enrollment period, which lasts from October 15 to December 7 each year. This will stay the same. But starting in 2019, the Medicare Advantage Disenrollment Period is going away, replaced by a longer and broader Medicare Advantage Open Enrollment Period that will last from January 1 to March 31, coinciding with the Medicare General Enrollment Period. In the old MA Disenrollment Period, you could only drop an MA plan and go back to Original Medicare if you were within the first year of signing up. Now, consumers have the chance to sign up in the fall and test drive the plan for three months before deciding whether to keep it, switch plans, or go with Original Medicare in the next year. Or, if they happened to miss the annual enrollment period in the fall, they have another chance to switch plans. On a different retirement-related topic, the Tax Cuts and Jobs Act of 2017 made a major change to Roth IRAs. You are no longer allowed to recharacterize, or reconvert funds. Previously, if you converted to a Roth IRA but were unhappy with the way the stock market played out, or if your income was different than planned, you could recharacterize by October 15 of the tax year after the conversion. Now, once you convert, the account must remain a Roth IRA. Finally, the Tax Cuts and Jobs Act has in some ways complicated filing taxes, not made it easier. Should you take the increased standard deduction or itemize? Are there ways you can give to charity and still get tax breaks? What about downsizing due to the limitation on deductions for state and local taxes and mortgage interest? For retirees, the amount paid in taxes may make a huge difference. Our calendar has a helpful reminder in February that you need to start organizing tax documents. Although most people don’t realize it, Medicare operates on a very strict schedule. Seniors need to enroll within a seven-month window surrounding their 65th birthday, unless they are covered by a qualified employer plan. If they are covered by an employer, they have until eight months after that coverage ends to enroll. If they miss both of these periods, they can enroll during the first three months of the year for coverage starting July 1. There is no enrolling outside of this time, and retirees may face penalties if not enrolled. Retirees need to file income taxes even though they no longer receive a salary. Distributions from investment accounts and Social Security might all be taxable, depending on their particular situation. Retirees may be surprised to discover that they need to file taxes not once a year, but four times. NOTE: Be sure that you recalculate how much to pay, now that tax brackets have shifted. In addition to yearly dates, there are quite a few birthday milestones that mark when retirees are eligible for certain benefits or are required to take action. These age-related markers do not change in 2019. As people age, it becomes even more important to have procedures in place for incapacitation or health care crises. On the brighter side, retirees need to make sure that their income will remain steady for the years to come. Here is a list of what retirees must do at least once a year, and with more urgency than in earlier life stages. Review beneficiaries on all pensions, IRAs, annuities, life insurance, investments, bank accounts, CDs, etc. Nothing stays the same forever, and retirement planning is no different. Currently Congress is looking at a series of changes to 401(k) plans, including reducing costs for small business, making it less risky for employers to offer guaranteed income annuities, and requiring plans to annually show workers how long their funds would last in the form of an annuity. Other proposals include changes to required minimum distributions (RMDs). Currently taxpayers cannot contribute to an IRA after age 70½, and have to begin taking RMDs. That age limit might be lifted or removed entirely. For many people, planning for retirement is the main reason they come to a financial advisor. They want smart investment and Social Security advice. Even after retirement, there is plenty of room for error when it comes to tax filing dates, RMDs, Medicare, and more. Capital Advantage is here to help you be prepared for all you need to do in 2019 and beyond.